*Special thanks to Rothy’s for partnering on this post! I am SO excited to get to try their amazing shoes that I have been stalking for years! Let’s get to the post! Have you seen these shoes around the internet? I have stalked them for years…and then they ended up stalking me in the form of ads and finally, we were able to meet in person. A true modern day romance. 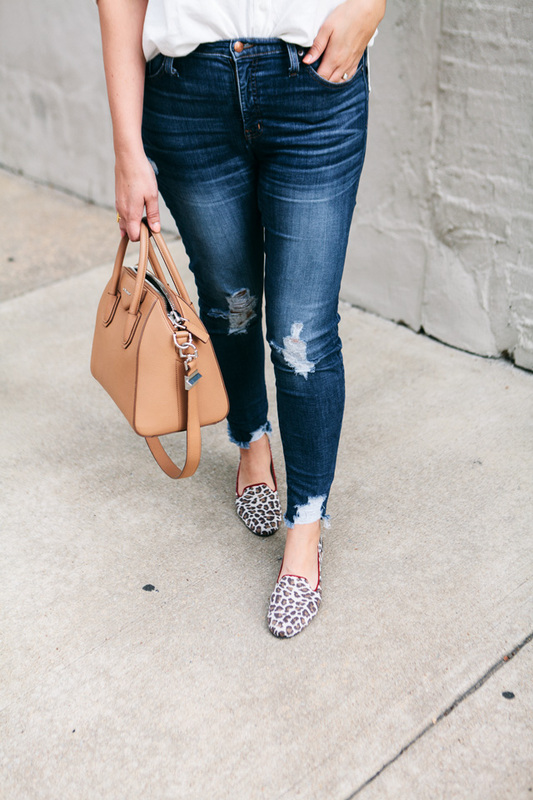 If you haven’t heard of Rothy’s yet, first off welcome back from under that rock and secondly let me introduce you to the softest pair of flats you’ll ever own. Seriously I wore them all day, literally on my feet all day, and they are perfect. There is no breaking in period for their shoes, you just slide them on like old friends and you carry on with your best day. So the thing with Rothy’s is that they are made from 100% post-consumer water bottles. YES. You read that right, water bottles. Which is a) amazing and also b) mind-blowing because they do not feel like plastic or breathe like plastic. I found them to have more of a fabric feel and there were literally no blisters by the end of the day. I am such such such a fan now that I have two pairs of them! So if you’ve been on the fence about them, go for it! Especially if you love flats. Since I received two pairs, I wanted to show the versatility of each pair and I wanted to give each pair the right amount of attention. 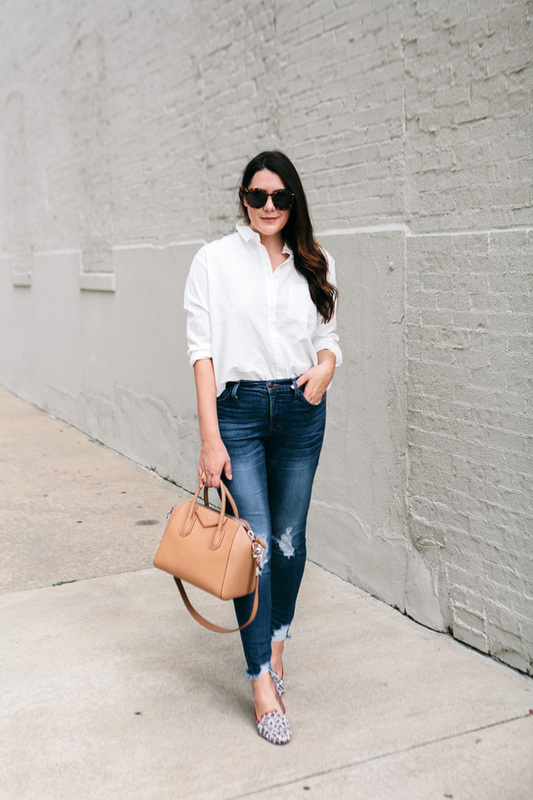 The Loafer is probably my favorite style between the two but I would absolutely buy The Flat in another color. I am in the Mocha Spot color here. (I’d also like to try their pointed toe flat, The Point as well, at some point! I think in the black or the flax birdseye would be spot on for an everyday shoe. But, I digress.) So the reason I really like The Loafer is the fit. 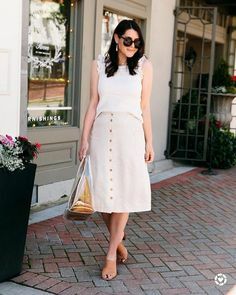 The band of the loafer at the top fits snug on my foot and it was super comfortable because I knew that it would stay on all day. Like there was no questioning that this fit my foot perfectly. At one point I kind of forgot that I had shoes on, ha! 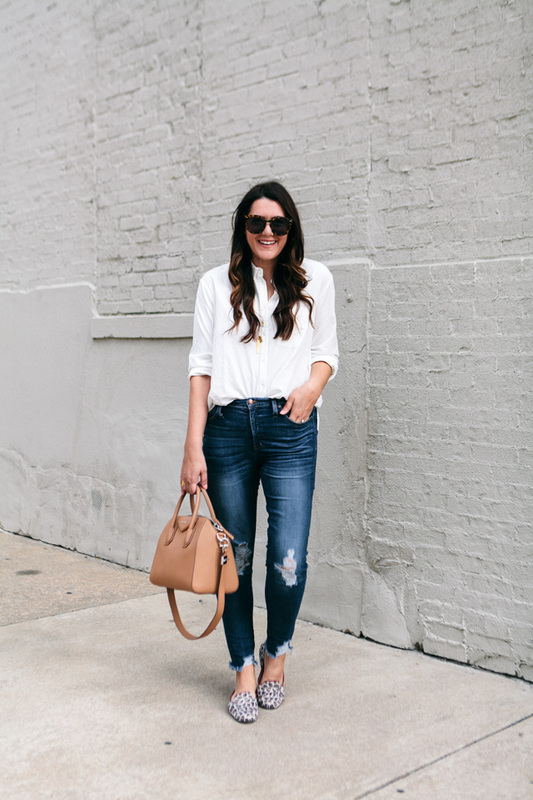 This pair is perfect to toss on with a simple tee or like in the photos a button down and denim and GO. They are perfect for an on-the-go lady or mama who needs style in a flash. You can find The Loafer in Mocha Spot here! 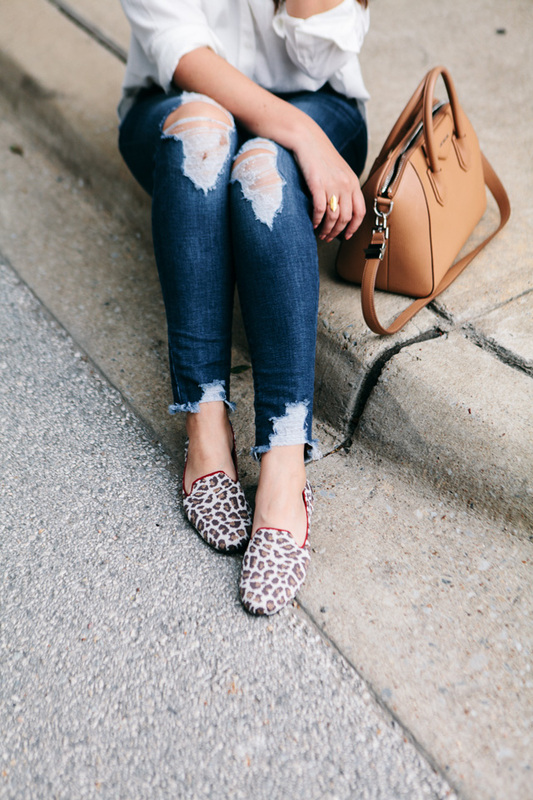 You can find all The Loafer options here! You guys know I’m extra enough to do two outfits in one post, I mean how could I not with such cute shoes? I know I said earlier The Loafers were my favorite, but only by a small margin. 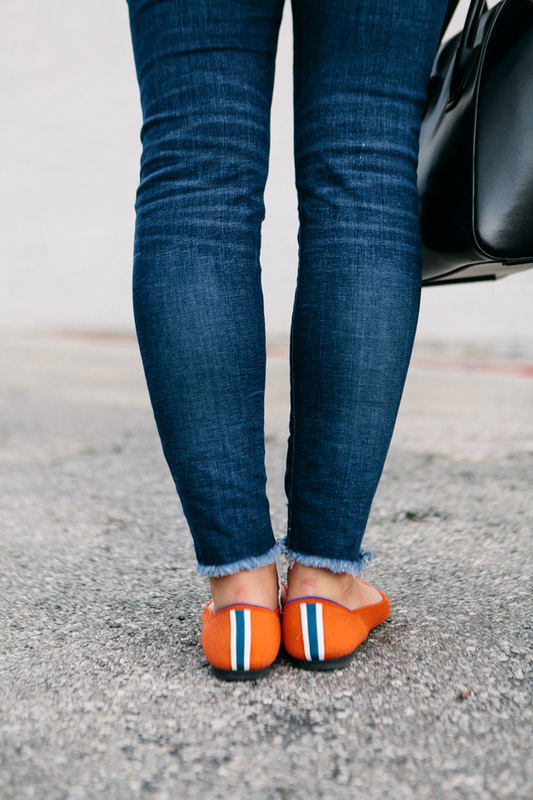 This bright pair is their rounded toe flat appropriately called The Flat. It’s honestly like trying to pick your favorite child when it comes to these shoes — I love them all and they all love me. The more I’m looking at these photos the more I’m missing these red flats. I wish I had them on today. I shall live vicariously through these past photos right now and put them on the minute I get home. 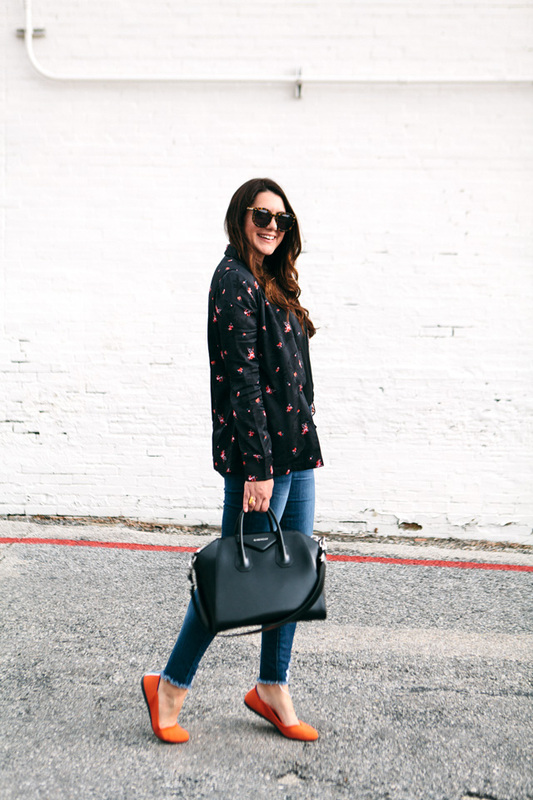 Just look how happy I am in those flats. Game-changers. The Flat was the first one that I tried and I LOVE the color of this flat. (I mean, of course, I would. Such a sucker for poppy red.) This is the Persimmon in Stripe. It’s a true poppy red/orange. GREAT for a pop of color! )I have this weird thing with flats and I don’t love them if they make my leg look shorter or stubby but because of the notch in this round toe flat, they actually are super flattering. 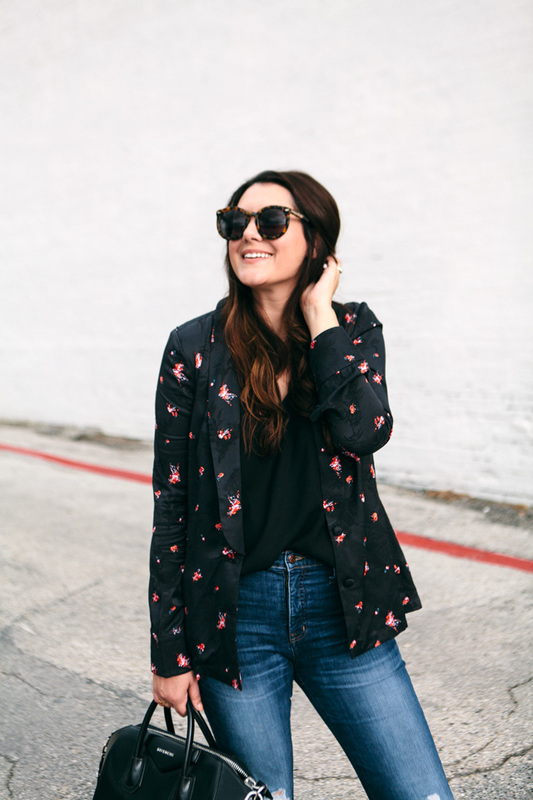 This pair is perfect to toss on with a tee and denim, obviously because of their casual vibes, but I loved how I could wear them a bit dressier with this floral blazer. In fact, I feel like they are the POP of this outfit. 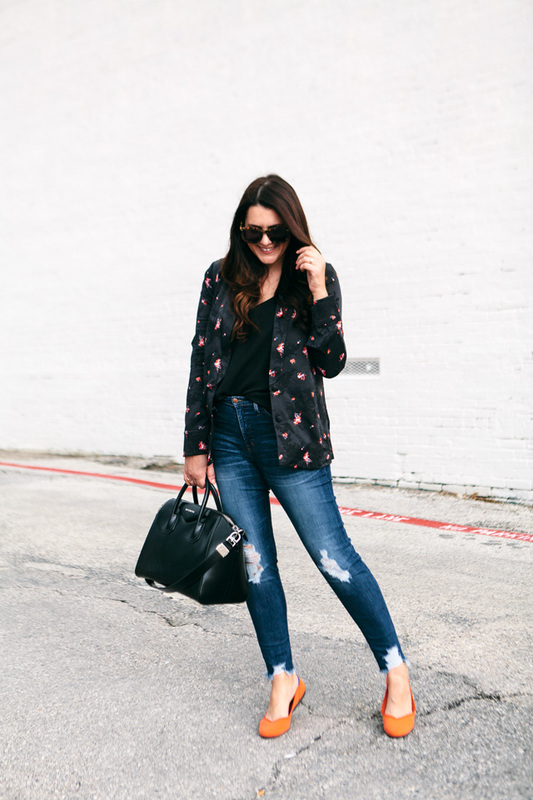 Forget the floral blazer, it’s the flats that are making the outfit! You can find The Flat here! You can find all the colors of The Flat here! Oh and the best part of these shoes? Completely machine washable. Can you even? No, I can’t either. If you have any questions on these, just let me know! I know this is a sponsored post, but I’m seriously such a fan. 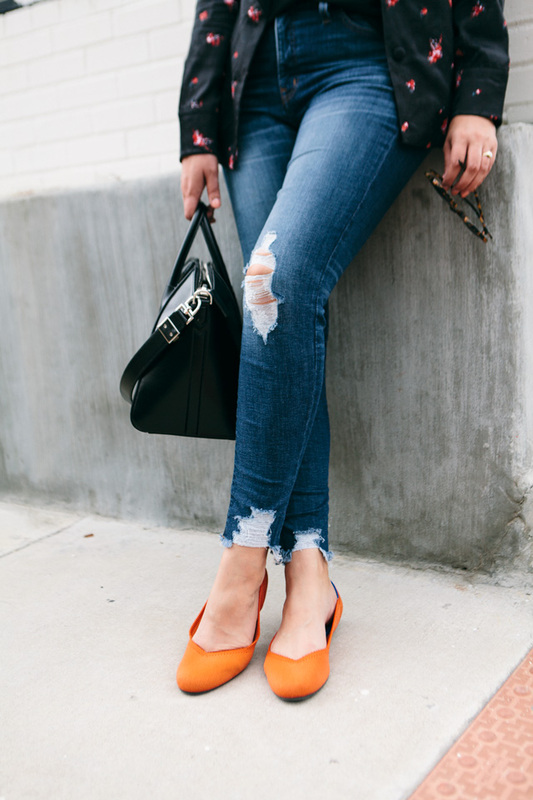 Those Flax hue Pointed toe flats are on my to-buy list this fall! I felt like the flats fit true to size, maybe a tiny bit large but not enough for me to size down a half size. If you are in between sizes, maybe consider it! The loafers I felt were a bit snug but I preferred this fit! I am a size 10 in shoes across the board and each of these is a size 10. I’ve been stalking them too and wondering if they’re the real deal! Love that they’re made with water bottles — that is so crazy and amazing. Love when I can feel good about the environment while shopping! I’ve always wanted to try Rothy’s but was so unsure if they are as comfortable as they claim they are. Love to hear that you love them! And i really like the ones you picked out! Oh wow! I need those shoes. No, I seriously need those shoes. My last pair of flats (all I wear apart from runners for city ‘exercise walks’ when we holiday) and steel cap work boots here on the station, are almost dead, so I actually need shoes. Those loafers shall be mine! I’ve been looking at their loafers and I think you’ve just convinced me that I definitely need them! 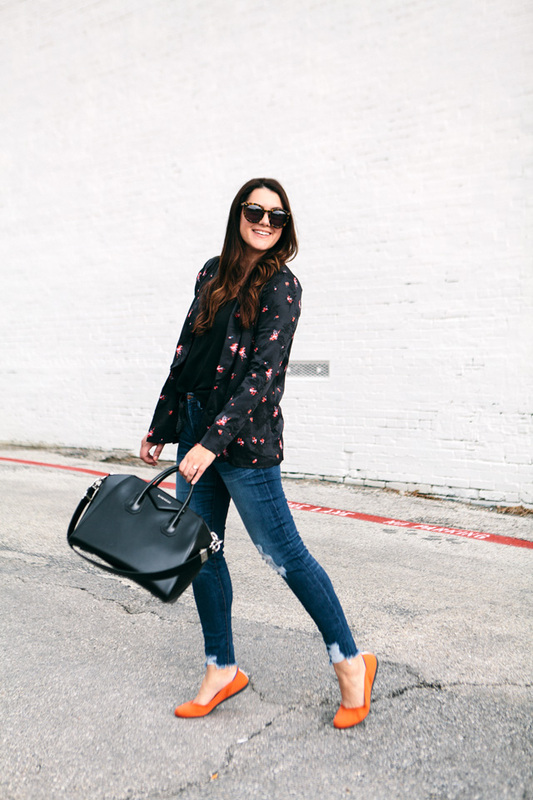 I love the fun print of those shoes! The first outfit is my fave! 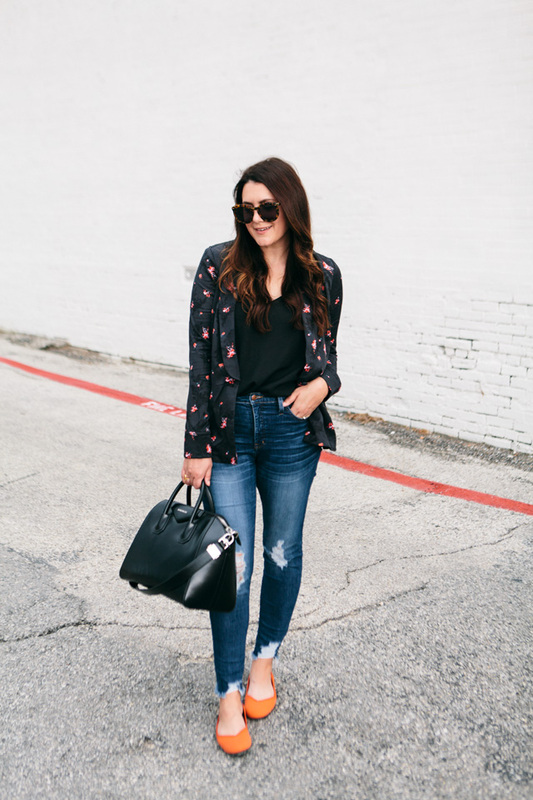 So casual and basic but then the printed shoes! Those red flats remind me of the red heels you used to love AGES ago!! Thanks for sharing your review. I really wish a giveaway would have been included, though. I am curious about these shoes, but the price point is high for casual flats, even ones with cool construction and features. It’s frustrating to see bloggers with a lot of resources, access to free/discounted clothes and footwear, and already-large wardrobes getting these sorts of deals while readers and those helping the industry… just don’t. 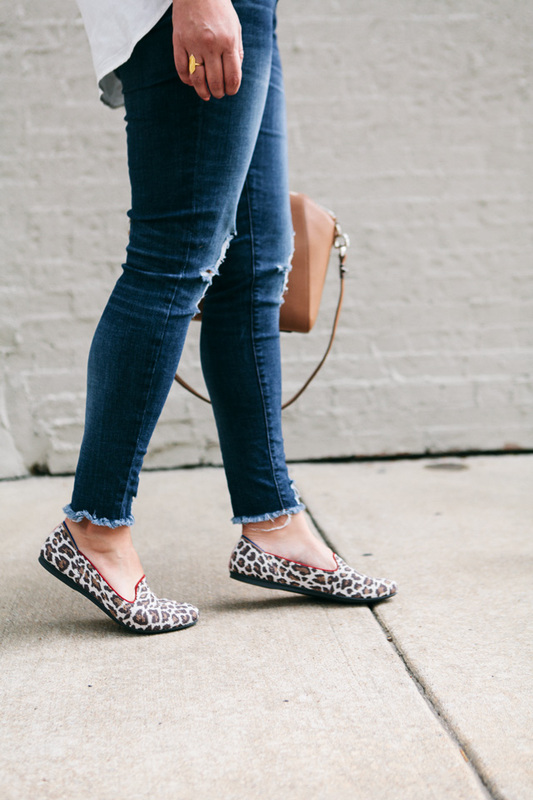 Oh my goodness, those leopard print loafers are SO cute on you! I might have to add those to my list for spring. 🙂 I have a few pairs of Rothys and have been really happy with them so far. 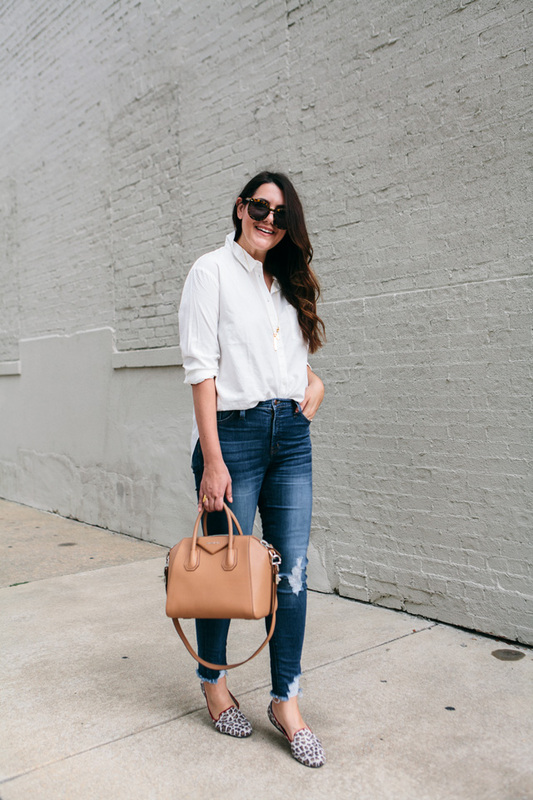 I have wide feet and found the flats to look most flattering (and fit best). The points made my feet look huge, but I love them on other people!